BERKELEY, Feb 29 2012 (IPS) - The world reacted swiftly to Haiti’s catastrophic 7.0 earthquake in 2010. The United States shipped in 20,000 troops, some to perform lifesaving medical procedures, others to protect aid workers from earthquake victims deemed dangerous. Movie stars, criminals and other prospective parents rushed to adopt motherless Haitian babies. Nongovernmental organizations (NGOs) and missionaries tripped over each other to distribute aid, from used shoes and bibles, to food and water. Televangelist Pat Robertson grabbed headlines, blaming the quake on Haiti’s “pact to the devil” – referencing Voodoo, Haiti’s traditional religion. The only ones absent from media reports, it seemed, were Haitians, except as tragic victims. A new book, Tectonic Shifts: Haiti Since the Earthquake [Kumarian Press, 288 pages], sets the record straight. The compilation of more than 40 articles is edited by Mark Schuller, assistant professor at City University of New York and the State University of Haiti, and Latin American specialist Pablo Morales. “One of the things we really felt was important was to get Haitian voices out there,” Schuller told IPS in a phone interview from New York. Half of the articles are written by Haitian activists, scholars and journalists, he pointed out. To tell the story of the temblor that killed more than 300,000 and displaced 1.5 million, Schuller and Morales include information on the history that has left the island-nation particularly vulnerable. “Understanding the disaster means understanding not only the tectonic fault lines running beneath Haiti, but also the deep economic, political, social, and historical cleavages within and surrounding the country,” the editors write. Haiti has been pummelled by external forces since its birth 200 years ago. Soon after Haitians threw off the yoke of France, the former colonizer led an embargo against the young black republic, forcing Haiti to promise France the equivalent of 21 billion U.S. dollars for the loss of land and slaves. The debt wasn’t paid off until 1947. Several articles explore international financial institutions’ neoliberal policies that led to overcrowding in Port au Prince and thus the large number of deaths and injuries from the earthquake. In one, Alex Dupuy, chair of African American studies at Wesleyan University, cites World Bank and International Monetary Fund support for urban assembly factories, which brought peasants to the cities. The international lenders further damaged the rural economy by imposing tariff reductions on agricultural products. Haiti’s markets had to compete with subsidized U.S. rice, “undercutting local production of the nation’s staple crop and dismantling the rural economy”, writes anthropologist Anthony Olivers-Smith. A major theme throughout Tectonic Shifts is the negative role of NGOs, present in large numbers even before the earthquake. In 1994, when President Bill Clinton brought President Jean Bertrand Aristide – Haiti’s first democratically elected president – back to Haiti after a coup d’état, the U.S. Congress bolstered NGOs’ presence. It refused to give aid directly to the Haitian government and instead filtered funds through NGOs, strengthening them and weakening the public sector. The number of NGOs multiplied after the earthquake and included, according to Yolette Etienne, Oxfam America Haiti program director, “the full range of humanitarians, ranging from the most specialised organizations to amateur groups and even criminals on the lookout to exploit all forms of human misery”. After the earthquake, the United Nations (U.N.) established “clusters” through which NGOs addressed issues of sanitation, water, food and housing. Haitians are also kept out of relief contracts. The Centre for Economic and Policy Research (CEPR) studied USAID contracts worth 200 million dollars and concluded that just 2.5 percent went to Haitian companies. A number of articles underscore the destructive role of the U.N. Stabilisation Mission in Haiti, or MINUSTAH. After the United States flew Aristide into involuntary exile in 2004, Marines policed the country for several months and were replaced by MINUSTAH. After the earthquake, the U.N. added more than 3,000 troops and police to the force, bringing the total to around 13,000. U.N. military personnel have been accused of acting like an occupying force, murdering and sexually abusing Haitians and bringing cholera to the country. “To many, MINUSTAH’s primary role is to keep Haiti as a leta restavèk, a child domestic worker serving foreign interests,” write Tectonic Shifts editors. The military’s preoccupation with security is incompatible with the “respect for the dignity… of the beneficiaries,” Vorbe writes. Mario Joseph, human rights attorney with the Bureau des Avocats Internationaux, writes that claims to land titles are unclear. “It is uncertain whether the alleged landowners who attempt to evict [Internally Displaced People] …really have legal rights to the land,” he explains. In a Skype interview from Port au Prince, Joseph told IPS that the debate around land ownership avoids the central issue: international law and U.N. guidelines prohibit eviction of IDPs. “But the U.N. doesn’t apply this in Haiti,” Joseph said. Still, the problem isn’t just with the U.N.
“The NGOs and the Haitian government, too, don’t… respect the rights of the Haitian people,” Joseph added, contending that because the international community put the president into power, government allegiance is to foreign interests and the wealthy elite, not to the Haitian masses. To that end, Tectonic Shifts includes several articles about international interference with presidential elections that excluded a dozen political parties including Aristide’s party, Lavalas, the largest and most popular party. “The international community is complicit with the rich people in Haiti to gut the rights of Haitians,” Joseph said, noting that he’s successfully trained camp leaders to organize others to effectively stand up for their right not to be evicted. 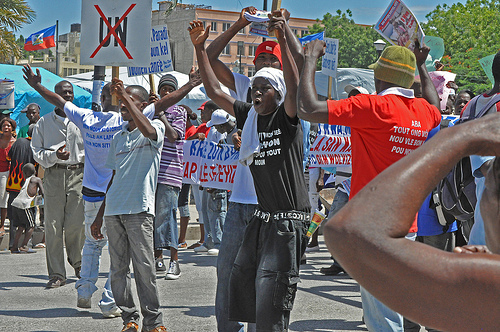 Tectonic Shifts includes hopeful articles about grassroots groups pressuring the government for change, but none address the future of Lavalas or the impact of Aristide’s return to Haiti one year ago. IPS asked Schuller about the omission. “As a political party, Lavalas is factionalized,” he said, underscoring that, as a foreigner, it was not his place to comment on internal politics. He said the editors attempted to be balanced and non- partisan in the choice of articles. “Maybe work is being done internally – they’re not out [in demonstrations] in big numbers; they’re not making a political statement,” he added. Creole and French translations of the book will be published later this year, which means Tectonic Shifts can be used as an educational and organizing tool by grassroots activists and human rights workers, Schuller said.